How a burglary descended into a police officer assault was described in a case at Leeds Crown Court today. Christopher Donaldson and Stuart Richardson appeared in the dock together at Leeds Crown Court today as they stood co-accused for a chain of events which began on Tuesday February 5 this year. Between 10.30pm that night and 6.30am the following day, a woman noticed that she had been broken into and various items had been taken including her handbag, purse and cash cards. Within 40 minutes they had been used at Sainsbury's in Ossett, Osset News and also the town's Co-op store. An attempt to make a transaction at the Gulf Petrol Station was declined as by now she had reported the theft to her bank. Donaldson, aged 41, was identified on CCTV by police who the following day went to his flat on Parkfield View, Ossett. Richardson who lives at Chickenley Lane, Dewsbury answered the door and told officers it was his flat. While police were there, Donaldson returned and was arrested on suspicion of burglary and hand-cuffed. Richardson was becoming agitated and the arrival of a third man to the flat meant that the police were out-numbered so they requested back up and attempted to handcuff Richardson, 44. Reading a police officer's statement to the court, Paul Nicholson,prosecuting, said: "I turned half around and saw him (Donaldson) leap off his chair, he struck me to the face and I could tell I had been hit with something and it was not just a punch." The officer believes he lost consciousness for a split second but then there was a scuffle as Donaldson tried to flee from the flat and the officer took more blows to the head and Donaldson threatened to hit him again with the handcuff. As blood was running from his head wound into his eyes, the officer used pepper spray to subdue Donaldson. The officer was taken to Pinderfields Hospital for treatment to have a two centimetre cut glued. He had a black aye and was x-rayed for what was feared to be a fractured jaw. Leeds Crown Court was also told that during police interview, Donaldson was "abusive and aggressive" and said the officer "deserved what he got". Richardson refused to come out of his cell to be interviewed it was also added. Defending Donaldson, Matthew Harding said: "Given the volume of offending and the number of times he has been dealt with by officers I support the assertion that he is not a man of violence. He said he had become agitated." For the handling of stolen goods and three instances of fraud, Donaldson was given nine months in prison to run concurrently and 18 months for the section 20 (assault) offence to run consecutive. Richardson was given 12 months for handling stolen goods that has been added to the indeterminate sentence he is currently serving. Judge, Mr Recorder Andrew Haslam QC said: "You both know that you are serial offenders, prolific burglars and have a substantial number of previous convictions. The impact of assaults on public servants cannot be underestimated and the impact on the police is substantial. This court will give officers the protection they deserve." 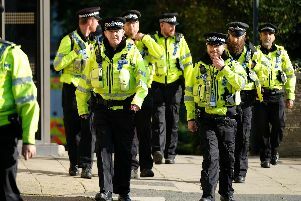 The 10 worst areas in Leeds for violence and sexual offences in 2019 according to police - how does your area compare?